Two weeks ago to the day I was in the hospital. I have debated on writing about this and I thought I would share. Perhaps, something I say will help someone?! So, let me back up the trolley on the story. I had been dealing with a bit of uterine prolapse for the past four years. I went for a second opinion (thank goodness I did). what I had been told by a previous Dr.
Fast forward to last month - I was lifting some heavy items (not really thinking) and uh, yeah. I knew right then and there that the whole plumbing had just fallen. I spent the rest of that weekend upset at myself and knowing I had to call the Dr. So, at the Dr's visit he told me what I had figured - time for surgery. My uterus had totally fallen and there was no going back. da Vinci Surgery for Partial Hysterectomy here I come. Next up was a trip to the Urologist. I also had an issue of leaking. It was decided that I should have a bladder sling (pig skin) added onto my surgery. I had five weeks to prep myself for surgery and get my ducks in a row. It was just my luck that my surgery date was the same date the boys went back to school. Surgery scares the bejesus out of me. I read may posts on a site called Hystersisters - I would highly recommend it. I know everyone is different and kept that in perspective. There was at least a place I could go to get a "feeling" for what I was about to go through. 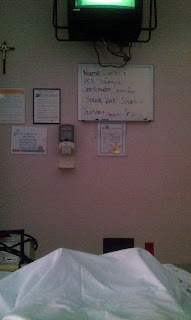 My pre-op nurse was wonderful. Full of great helpful information about how to deal with my issues. I get sick from anesthesia so that required a sea sickness patch. Just to eat light the day before. The nurse had me sit slightly up to wash my back off with alcohol. Could I get any colder? My nurse kept saying, "I'm sorry, dear." Then it was lights out once my anesthesiologist had me take two deep breaths. I was sore - the abdominal area from where I was injected with air. Meds in the hospital were super. Sea sick patch had to come off because it made me uber dizzy. I was up within 24 hrs walking gingerly around the hospital, showered & home. 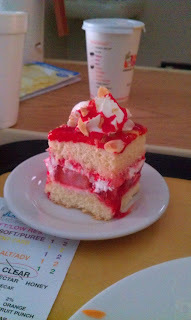 Yes, that is a slice of the strawberry shortcake. This hospital has some of the best food for a hospital. It is going down but not as fast as I would like. My incisions are healing nicely and the liquid stitch is finally coming off. Helping out lightly around the house as I can. Still NO bending over or lifting anything heavy. I have learned that Oxycodone & Loretabs and I do not get along. Nauseous with one and dizzy with the other - rendered my quite ill for a bit. Just stuck it out with Advil. I am sore still in my belly but that is normal for some. My tailbone was injured at some point (surgery(?)). I am looking forward to getting out in about 5 wks to go on long walks with Sasha. She (Sasha) pulls still on her leash (still) and I don't want to do any damage. I would highly recommend the da Vinci surgery if it is an option for you. Gold Star to those who read this all the way through. Sandy... so sorry to hear about your surgery... being a woman sometimes is NOT fair... it sounds like you're doing well and I'm glad!! Tummy bloat..UGH!! Get some rest and before you know it.. you'll be feeling fabulous!! !